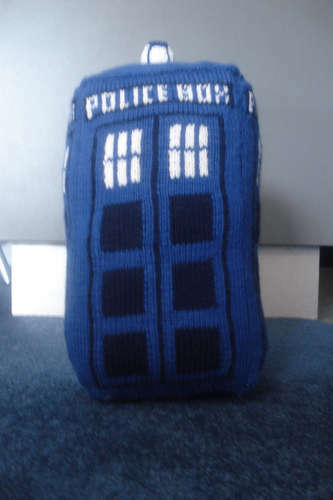 The worlds of Doctor Who and knitting don’t often collide, it has to be said; but when they do you know you’re in for something quite magnificent. The Fourth Doctor’s scarf is an obvious candidate, but we forget the other lesser-known additions to this shared canon that are owed their rightful place, like the appearance of the Clangers in The Sea Devils - those wonderful pink-yarned creatures clearly coveted by the Master. And rightly so. Isn’t it a beauty? Click here to see more views of this creation by Christchurch’s crafty Pixelbrid. Better still, if you register with instructables.com you can vote for the TARDIS in the current competition and pass a few more virtual props on to its creator. Don’ be swayed by the Princess Leia hair helmet – this is the real deal! Ah, Gwen and Rhys… this episode does bring up the many love “relationships”. Gwen and Jack look set to get hot and heavy, and once again we are reminded that Tosh has a thing for Owen… which is really getting boring. Either move that relationship on, or give it up, people! As for Gwen and Owen… that seemed to disappear around the time of Out of Time, and we haven’t missed it since. At least there’s still Jack and Ianto, with Ianto slipping from comedy fumbler to action hero with merely a scene change… which really smacks of inconsistency. One or the other, people, and preferably not the slapstick version, as that’s really not working. A decent episode from the character point of view, a bit of a fizzler from the point of view of actual plot. I can’t entirely decide if this is a good episode yet or not, that will have to wait until we can see if there is impact from the Rhys decision. Okay then. Screencaps from the series 4 cinema trailer have begun to appear online, so now’s as good a time as any to begin rummaging through the goat entrails to see what’s in store this year. The following is a little bit of confirmed stuff, a little bit of rumour, some speculation and, I hope, not a lone voice in this exercise. It would be great if Jono was here as he used to do this bit, but British Rocket Group have got their own problems, apparently. Needless to say, after the break there are images and there may also be spoilers. Helen Raynor delivers a smashing script that demonstrates the changes brought to season 2 Torchwood. Although there is still no sign of the humour of the first episode (perhaps when Captain John comes back), but we are treated to a far more mature team of Torchwood crew than we ever saw in season 1. In particular, this is a Toshiko episode, and she has grown up a lot since Greeks Bearing Gifts. This is something we have definitely needed. As yet, we can’t tell is Owen has developed that much (he certainly seems more adult, but I’m waiting for the inevitable Owen-centric episode), but there is plenty to see for Tosh. Jack comes across as rather harsh to her (especially considering the more usual ‘soft-touch’ approach), but I like that. Jack is being the team-leader, and these are the kind of hard decisions a leader should be making. This could easily lead to the team fracturing, but hopefully this more mature grouping will recognise (and I do think Tosh did acknowledge, if not like, Jack’s reasons) as a necessity. Helen Raynor (and, frankly, I might be inclined to see Evolution of the Daleks in Manhattan as a hideous, hideous aberration) also treats us to early Torchwood, with two incredibly English characters of George and Harriet. Fine, we only see them briefly (and at first I thought of them as local Ghost Hunters, although quickly realised they were Torchwood), but they do come across as more competent that our own Torchwood team. It’ll be nice to explore the wider Torchwood universe (and, yes, there is still that missing Torchwood haunting fan-obsessers’ dreams), so wouldn’t turn down another chance to see that pair in action (although I don’t think we could manage another Torchwood spin-off). But not everything can be about the characters (although even the Declassified is forced to talk about the characters and not rave on about the effects for the entire episode), so we must look at the plot sometime. What there is of it keeps moving along (although I notice that only Gwen gets the “scary ghost” moments, have to pick on some woman, I suppose, and Tosh is otherwise occupied), but there are a few deus ex machina plot elements dropped clunkily into the episode. The rift manipulator springs immediately to mind (I hope Torchwood retrieved that! ), and Owen’s fridge makes a second appearance this season as the hold-all of useful items. Considering all the alien-tech Torchwood has (and already has proven prone to using this season despite earlier protestations), must it all come down to the blood? Is this some extended metaphor for bringing the team together or just a sign of co-incidental plotting? Time will tell (ObQuote: it always does). Three episodes down, and only one forgettable episode so far. Torchwood is off to a good start, although we have yet to see real evidence of a lighter atmosphere. Still, as they say, keep watching the skis! Behold the Season Four trailer, in all its phone-cam goodness! News highlights of the past month – now with click-along-a-pictureness!